American Center is part of a strong legacy of cultural programming at universities like Tufts. “I feel it’s important for this kind of legacy to be recognized, to continue and to grow with institutional and student support,” Yugawa said. Activists march in a loop outside of the McGrath Highway Stop & Shop during a UFCW Local 1445/Massachusetts Jobs for Justice rally in support of Stop & Shop workers on March 23.
venient and has products he cannot get elsewhere, while Denby said he was more likely to stay away. “If they aren’t being paid properly, I don’t want to give Stop & Shop my business until they remedy that,” Denby said. “I’ll stop coming here until I find out it’s sorted.” Oliver Marsden, a junior who lives on Chetwynd Road — a brief walk from Stop & Shop — usually does his grocery shopping at the Alewife Brook location because of the convenience and the low prices, but says he will be shopping at Trader Joe’s during the strike. Marsden also mentioned the Tufts Dining workers’ campaign, saying it had increased his awareness of the labor movement and conditions for low-income workers. “It was the first time I’d ever personally encountered people who were not being treated fairly and spoke up to do something about it, so it showed that we can actually make an impact here,” he said. TUESDAY “Opioid Crisis Speak Out and Cannon Painting” Details: Newly formed group Sack Sackler will invite students and Tufts community members to share their stories of being impacted by the opioid crisis and addiction, followed by painting the cannon. Where and when: The Cannon; 8:45–10 p.m.
WEDNESDAY “Edible Insect Festival @ Tufts” Details: The Tufts Green Fund will welcome Brooklyn Bugs chef Joseph Yoon to create gourmet bug-based meals for event attendees, as well as discuss the future of sustainable eating and insect consumption. Where and when: Science and Engineering Complex Atrium; April 17 at 11:30 a.m. and April 18 at 9 p.m.
THURSDAY “Health, Safety, and Sustainability Day” Details: In memory of School of the Museum of Fine Arts (SMFA) lecturer Julie Graham, the SMFA community will change its normal programming to a day of workshops on how to promote healthy and sustainable approaches to artwork and art creation. Where and when: School of the Museum of Fine Arts at Tufts; 12:30–3 p.m.
FRIDAY “Earth Fest 2019” Details: Students for Environmental Awareness will begin this year’s Earth Day festivities with an event featuring a sustainable cookout, a clothing exchange, and tabling for student groups focused on environmental justice and preservation. Where and when: Academic Quad; 11 a.m.–2 p.m.
Tisch Library, April 17 Please join us on Wednesday, April 17, 3:30-5pm, when the eighteenth Maxine Newberg Gordon, J70, Book Prize will be presented to Mallory Grider, A19, in the Austin Conference Room at Tisch Library. This award is presented annually to a mathematics major who has demonstrated a love of reading, literature, and poetry. In conjunction with the book prize event, Professor Christoph Börgers will give a talk about Tufts' Department of Mathematics, its accomplishments, and its role within the university. verall, this past week has been high quality: I went to my visiting host mom’s school with her (she’s a fifth-grade teacher), and I went with my cousin and her parents to the Danish Royal Ballet. Things have been really great, except for the fact that finals are starting to roll toward us like a truck. Yep, that’s right — you actually do have to study when you’re abroad. It’s definitely challenging to feel motivated while I’m trying to live it up in another country, especially since the weather is starting to get nicer — the sky has been so blue lately! Even with a lot of work building up, I’m still trying to keep a balance between schoolwork and fun activities. Here are some tips on how to manage the increasing workload and the decreasing amount of time abroad. For one thing, I haven’t planned many trips besides the upcoming Easter break for any weekends in April or May. While there are still other places I want to visit, I want to make sure I have enough time to explore other places in Denmark I haven’t been to yet. I haven’t run out of things to do around the city and my host mom has several more things planned for us, which is great for getting more immersed in the culture before I have to leave. Plus, this way I have time to get my work done and feel less stressed about it. Second, when the weather is nice, I try to spend most of the day outside. I try to stay out and about during the afternoon until dinner or until it gets dark out before I do my homework. That way, I don’t feel like I’m missing out on the beautiful weather. Even when it’s a bit colder, I love to just walk around outside. Or, when I feel really overwhelmed by work, I take a walk to the beautiful Black Diamond library. It’s located right on the water and there’s a huge window that spans the entirety of one wall. It’s perfect because I can get my work done while still getting a nice view of the harbor and the sunny sky. Of course, when necessary, I’ll hole myself up in the DIS common rooms to do work, but I’ll always try to end the day with a movie or something fun to balance it out. Third, it’s definitely important to actually try and enjoy classes. I lucked out and ended up in a really great core class (Child Development in Scandinavia), and I’ve become close with a lot of my classmates. This might sound super nerdy, but I actually really do look forward to my Monday class every week. Our teacher is hilarious, and we always have a good time together. Hopefully I can continue to be productive while still enjoying the time I have left here. I’m also preparing for when I inevitably become extremely nostalgic during my last week or two — there will be definitely be some tears. Allie Morgenstern is a junior studying child study and human development. Allie can be reached at allison.morgenstern@tufts.edu. continued from page 4 from data collected around incoming firstyears that the prevalence of vaping is more significant than smoking traditional cigarettes,” Forster said. The initiative is by no means new to Tufts, having been established back in 2013, and for most of its history, it sought to implement a tobacco-free policy on the Medford campus. Having faced administrative roadblocks in making Tufts tobacco-free, Forster, who joined the initiative in her first year at Tufts, said that it is now channeling more of its efforts towards education, with an emphasis on reducing e-cigarette use. “Our main goal is … to raise awareness about the potential health and environmental risks that come with [vaping today],” Forster said. “We’re also hoping to expand our social media presence with more educational pieces.” She acknowledges, however, that this is still in the works. The Daily survey found that 95.9% of the 243 respondents were not aware of any on-campus efforts to reduce or prevent vaping. In addition, Forster said that the initiative is working on strengthening its ties with both public health organizations and environmental groups at Tufts, given the health and environmental issues caused by vaping. Administrative efforts Similarly, part of the Department of Health Promotion and Prevention’s effor ts in managing vaping trends will emphasize education and access to information about vaping. “We want to make sure … that [students are] educated, so when they do make a choice, either to use e-cigarettes or not use e-cigarettes, they’re very educated consumers, and can understand the health impacts and everything else that might happen,” Wong said. The department also offers resources for individuals who wish to quit vaping or smoking. According to Wong, they work closely with the Health Service, as well as the chaplaincy, Tufts Dining and the Friedman School of Nutrition, to provide students with a host of options to help them live healthier lives. Colette Smith is a first-year who has not yet declared a major. Colette can be reached at colette.smith@tufts.edu. Madison Lehan is a first-year who has not yet declared a major. Madison can be reached at madison.lehan@tufts.edu. The Harvard College Film Festival hosted an advance screening of Olivia Wilde’s feature film directorial debut, “Booksmart” (2019), at the Brattle Theatre in Cambridge on Thursday, April 11. The hilarious and heartfelt coming-ofage story follows Amy (Kaitlyn Dever) and Molly (Beanie Feldstein), two best friends who’ve tackled their high school careers with a no-nonsense attitude. They’re at the top of their class, involved in plenty of clubs and constitute the very definition of driven. But on the night before their graduation, they discover that they’ve missed out on the parties and the social aspect of their past four years. In what is arguably the most important scene of “Booksmart,” Molly tells Amy they must have done something wrong. Now, they’re determined to get it right. They spend most of the film traveling to different parties, desperate to make up for the fun they missed out on while hitting the books. Their journey is laughout-loud funny at some moments; any scene with Gigi (Billie Lourd) practically oozes comedy genius. Their journey is also deeply raw and all about their friendship and the bond they’ve built. There are scenes where that bond is tested, where it’s impossible not to feel invested in Amy and Molly’s lives. “Booksmart” is a testament to Wilde’s directorial and storytelling abilities, Dever and Feldstein’s acting and chemistry and how relatable a coming-of-age film can feel when it’s authentic. After the screening, Wilde, Dever, Feldstein and Katie Silberman, one of the film’s screenwriters, were brought onstage for a short Q&A. Wilde talked about her methods behind directing “Booksmart,” which included the benefits and struggles behind the film’s short 26-day shoot and working with Silberman on the script. Dever and Feldstein were practically indistinguishable from Amy and Molly; They looked like close friends, which became especially clear when they lived together in an apartment during pre-production. Wilde said that her dream was to make “Booksmart” a “generational anthem.” It’s undeniable that she succeeded. there, and so much trust there, we just layered Molly and Amy there.” The character of Molly herself didn’t come so naturally to Feldstein. “As far as Molly, she didn’t come very easily to me. I felt very intimidated by her,” she said. “I had been used to being supporting characters who come in and are the joke, and then they leave. I was really intimidated to be on this two-person journey where the two of us are the story.” Dever echoed Feldstein’s sentiments as she discussed being one of the leads of “Booksmart” — intimidating, but alongside Feldstein, easy. “It was really nice to have Beanie’s hand to hold throughout the process,” Dever explained. “We both realized, ‘Oh, we’ve never led a film before,’ and that’s super scary, and it’s always amazing to have that best friend to go through something scary. You also can’t fake chemistry, I think, so it was very easy to love Beanie. It was all about doing normal, real-life things.” Wilde herself saw that bond, not just between the two leading actresses, but beyond them. “They did it with the rest of the cast, too,” Wilde said. “These two carrying the lion’s share of the material and working so tremendously hard — [they] didn’t have to be kind of generous with their energy and their spirit as they were with the rest of the cast. But it was like everyone was a team.” For some of the cast of “Booksmart,” this was their first time acting. Wilde commented that she kept the set fresh and exciting for them by playing music, taking fun pictures and having them bond off-set on trips to get gas or buy food. The cast is varied, interesting and full of unique personalities that become increasingly lovable and relatable as the film goes on. Sure, “Booksmart” is a film about two best friends, but the community they recognize and the connections they make are just as important. Wilde’s generational anthem is surely something to be impressed by. For an actress, director and activist of Wilde’s standards, her methods and creative process in making “Booksmart” are simply genius. It’s a film with heart, soul and authenticity. It’s could be the film of the summer, maybe of the year. It certainly deserves to be. “Booksmart” will be released on May 24. The owner of Spag’s, Antonio Borgatti is depicted. time, upon catching a man shoplifting some boots and learning that he and his family had fallen on hard times, Spag gave him those and more. The kind, neighborly ways of Antonio Borgatti were beloved by all, and unfortunately seem to have fallen out of fashion. Spag’s was shut down in 2013 after having been acquired from Borgatti’s family in 2003. Spag had passed away in 1996, and thus did not live to see the roughest times in his business. It seemed that his friendly ways just weren’t sustainable in the late ‘90s; the new commercialism of the 21st century dominated the corner store competition. Now the original Spag’s has become a complex as part of the redevelopment of Route 9. This complex includes a Whole Foods, a couple restaurants and apartments as well. The spot where Spag’s sat for years was demolished and seemingly forgotten. So how did Tufts get this trailer? Well, that is the real mystery. Spag’s used to have hundreds of trailers in their fleet, and given that the store is no longer open, it’s possible that they are very cheap to buy, if not free for the taking. After all of this snooping, you might why Tufts didn’t paint over this trailer. Perhaps they thought it would be a kind of funny, quirky thing to leave in front of Houston Hall. Disciplined practice matters with a physical goal. You’re exceptionally clever with communication over the next three weeks with Mercury in your sign. Express your creativity. Difficulty Level: Doing literally no work over the long weekend. 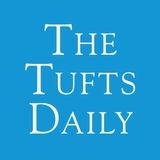 The Tufts Daily is a nonprofit, independent newspaper, published Monday through Friday during the academic year, and distributed free to the Tufts community. The content of letters, advertisements, signed columns, cartoons and graphics does not necessarily reflect the opinion of The Tufts Daily editorial board. EDITORIALS Editorials represent the position of The Tufts Daily. Individual editors are not necessarily responsible for, or in agreement with, the policies and editorials of The Tufts Daily. OP-EDS The Op-Ed section of The Tufts Daily, an open forum for campus editorial commentary, is printed Monday through Thursday. The Daily welcomes submissions from all members of the Tufts community; the opinions expressed in the Op-Ed section do not necessarily represent the opinions of the Daily itself. Opinion articles on campus, national and international issues should be 600 to 1,200 words in length and submitted to opinion@tuftsdaily.com. The editors reserve the right to edit letters for clarity, space and length. All material is subject to editorial discretion and is not guaranteed to appear in the Daily. Authors must submit their telephone numbers and day-of availability for editing questions. ADVERTISING All advertising copy is subject to the approval of the Editor-in-Chief, Executive Board and Executive Business Director. t shouldn’t take too much activism or comment to convince our leaders at Tufts that severing ties with the Sackler family is a good idea. More than 130 people die each day in the U.S. due to opioid overdoses in an epidemic kicked off in the 1990s by Purdue Pharma and their aggressive marketing of OxyContin. The Sackler family name graces the Tufts Graduate School of Biomedical Sciences, but the university remains frozen, unable to take a stand against a wealthy patron even as lawsuits mount from more than 500 cities, counties, and tribes across the United States. University President Tony Monaco instead decided to equivocate, releasing a note to the Tufts community on March 25th announcing the hiring of a special investigator to review the university’s relationship with the Sackler family and recommend a course of action. Evidently, Tufts believes a single lawyer will deliver clearer results than volumes of publicly available information and nearly two decades of accusations, lawsuits and epidemic death across our nation. Tufts will wait until attorney Donald Stern delivers his review “prior to making any final decisions.” This, without question, is a morally bankrupt course of action for Tufts to take. The Sackler family has shown a consistent lack of empathy toward the American people and patients abroad, even suggesting that the blame for opioid addiction lay on those who were prescribed the painkillers by their doctors. Decades of shameless profiteering by the Sacklers have brought us all to a moment of reckoning. I know people who have died as a result of this epidemic. Nearly everyone does. In 2015, Monaco showed no such hesitation and did not await the results of Bill Cosby’s 2017 trial before revoking his honorary degree at the recommendation of the Board of Trustees. But, of course, Tufts has to conduct special investigation — paid for by our hard-earned tuition dollars — to confirm that the Sacklers have the same “lack of character and integrity that clearly does not represent the values to which our university is committed and for which [they were] honored,” as Monaco wrote of Bill Cosby. To be clear, there is a precedent for the revocation of university honors. In 2015, Tufts University’s leadership clearly placed great value on the accusations against Bill Cosby and determined that it would be a poor choice to continue its association with the once-beloved public figure who is now a convicted felon. Today, the university is failing to place the same value on the thousands of accusations against the Sackler family and Purdue Pharma. Why are the Sacklers being held to a higher standard of evidence than Cosby? Perhaps it is because Tufts views right and wrong in a different light when money is involved. There is no question that we must repeal and replace the Sackler name at Tufts. Take that hateful name off of our medical school, and revoke the two honorary degrees given unnecessarily to members of the Sackler family. We don’t need their violence at Tufts, nor do we need leadership that is unwilling or unable to stand for what is right. Tys Sweeney is a sophomore studying political science. Tys can be reached at tys. sweeney@tufts.edu. Explore Earth and Ocean Sciences with us! EOS 1 will be offered this fall! There is one lecture (MWF 10:30-11:20am) and three lab sections (M, T, or W 1:30-2:45pm). View all our courses here: eos.tufts.edu/courses/ Stop by Lane Hall or email lindsay.riordan@tufts.edu if you have any questions. he Los Angeles Lakers’ season began with more promise than most — the NBA’s premier franchise once again had the best player in the NBA suiting up for them every night. Lakers legend Magic Johnson was on board, and he was reformulating the roster into one that would win again. Then he signed Lance Stephenson and Rajon Rondo, then he traded Zubac for next to nothing and then the Lakers went 37–45 and missed the playoffs. A fan base that two months ago was convinced they were going to get Anthony Davis to pair with LeBron James is now grappling with a lottery team whose general manager just resigned and whose coach has been traded. Magic Johnson’s resignation speech was a great exclamation point to the season, as he gave a number of strange justifications for leaving. One justification went like this: “I’m a free bird and I’ve been handcuffed.” Or another one: “I think I had more fun when I was able to be the big brother and the ambassador to everybody.” Johnson continued: “I thought about Dwyane Wade retiring and I can’t even tweet it out, I can’t be there.” So Magic Johnson is essentially telling us that he left his job so he could get back on NBA twitter. This Lakers season has shown that the big market method of building teams that teams such as the Lakers and the Knicks have traditionally advocated for is failing. NBA markets are growing across the board and the small city teams are not as disadvantaged as they used to be. Big markets like the Lakers, Chicago Bulls and Knicks have struck out on their free agency acquisitions over the last 10 years. The Bulls haven’t gotten anyone besides Wade — far past his prime, no less — and the Knicks landed big names like Derrick Rose and Joakim Noah after years of injuries had hampered their performances. Even the Lakers’ getting LeBron has been qualified now, as it appears he is heading into the twilight of his career. The teams that have built themselves through smart player development and drafting such as the Warriors, the Celtics and the Raptors have demonstrated how to succeed in today’s NBA, which differs vastly from yesteryear’s in terms of cap flexibility, team chemistry and the amount of players that are buying into the team culture and system. The Lakers method of using the flash of Los Angeles, Calif. and the stardom of Magic Johnson to attract great players doesn’t seem to be working in the way that everyone hoped it might, and it seems less and less likely now that Paul George, Anthony Davis, DeMarcus Cousins or Kawhi Leonard are ever actually coming to join LeBron. Before any of that can even happen, the Lakers have to instead worry about actually getting a coach and a general manager, and the current state of affairs hasn’t given fans any reason to have faith that they will do a good job with those hires, either. Sam Weidner is a junior studying mathematics. Sam can be reached at samuel. weidner@tufts.edu. have different philosophies and approaches to drafting and free agency. Every time you’re walking into a new locker room, you’re joining a new company. It’s like a new family.” At the core of the NFL experience is a sense of raw, uncontainable emotion that can consume a player when self-doubt enters his psyche. It can happen at a player’s first mini-camp, regular season game or even right when he’s drafted. For Bergeron, those moments are what makes the experience memorable. “They’re all part of what makes that sport so fun, the real raw emotional [elements]. The stakes are really high, and they make the fear element of that game highly motivating,” Bergeron said. “It’s a real driving force that can be incredibly powerful when harnessed the right way.” At the end of the day, for all the NFL’s flaws, Bergeron can still point to countless incredible opportunities and people he has seen through playing in the league. Bergeron specifically pointed to Chris Draft, who, like Bergeron before him, was a linebacker at Stanford and played for multiple teams throughout his career. On the field, he knew defensive schemes inside and out and was a player’s favorite on the teams he played for, according to Bergeron. More impressive for Bergeron, though, was his commitment to the community. “I think he was the gold standard for being incredibly focused when it came to his discipline and craft … he really understood schemes and what a defensive coordinator wanted on the field,” Bergeron explained. “He was also an unbelievably involved community person. He spent all of his time up in the marketing department’s office, working with the community outreach teams. A lot of guys really looked up to him.” Draft represented to David and countless other players a side of the league fans often do not see. One where a love and knowledge of the game dovetails with its power to positively impact community outreach and awareness. Years after hanging up his cleats, Bergeron still looks back at his time in the NFL with a special kind of love for the game and the competition it provides.